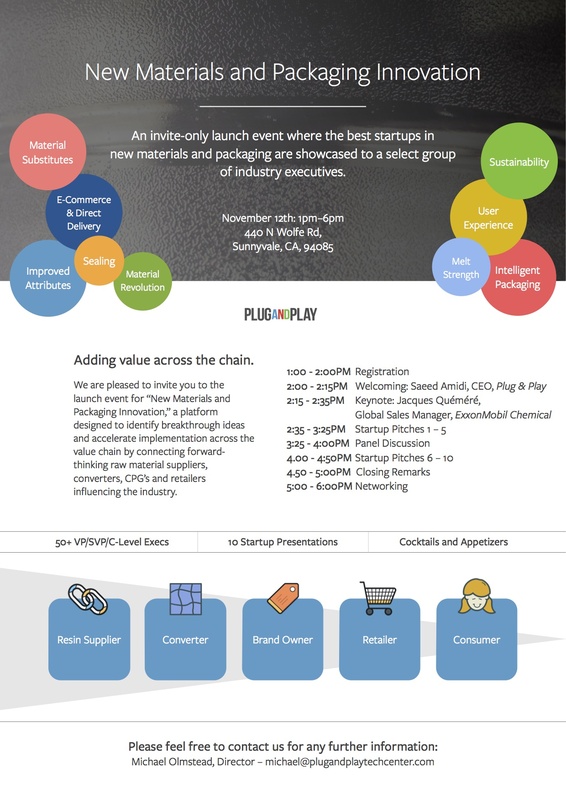 The next 12th of November of 2015 the event “New Materials and Packaging Innovation” will take place in the facilities of our sister company Plug and Play Tech Center in Sunnyvale, California. Plug and Play is one of the most well known business accelerator, specialized in growing tech startups. This event has been created to present breakthrough ideas and accelerate implementation across the value chain by connecting forward-thinking raw material suppliers, converters, brand owners and retailers The best start ups in new materials and packaging will show their ideas to a select group of industry executives. Material substitutes, improved attributes, new sealings and improving the user experience through different ideas of intelligent packaging are some of the ideas that will be presented during the journey. If you are interested in attending this event, please contact us.